Arching barriers of ice locked solidly to land are presently closing off Nares Strait for all ice leaving or entering this ocean passage from the Arctic to the North Atlantic Oceans. Gothic cathedrals have flying buttressing to hold them in place while ice arches have buttressing land that keeps them stable. The sea ice becomes land-fast until these ice arches collapse in June or early July. As the ocean under the ice is still moving, generally from north to south, one often finds very thin ice or even open water to the immediate south of these ice arches. Some of these temperature signals let us “see” large ice structures even in the dark of night which in Nares Strait lasts from early October to late March. 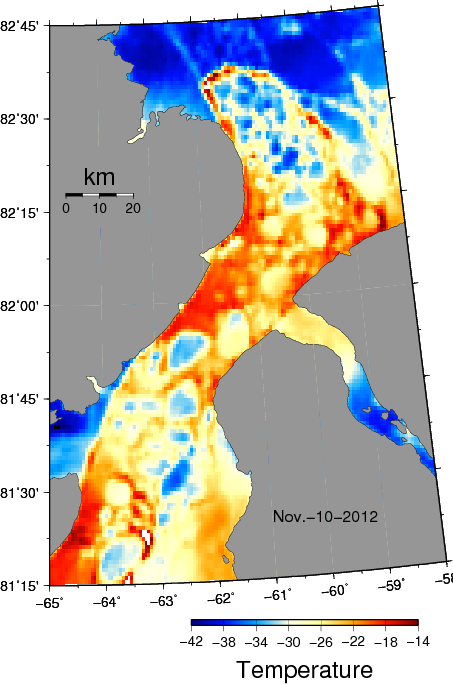 Surface temperature in degrees Celsius for Nares Strait on Nov.-10, 2012 from MODIS Terra. Thick ice is blue (cold) while thin ice is red (warm). Surface temperature at the northern entrances to Nares Strait with the Arctic Ocean to the north. 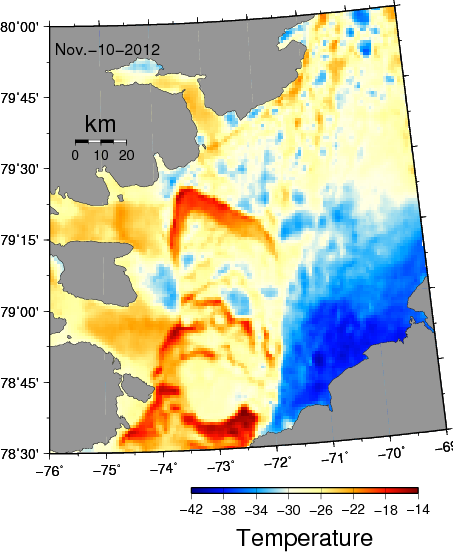 Surface temperature at the southern entrance of Nares Strait with the North Atlantic Ocean to the south. These ice arches usually form in December or January, but this year they form a little earlier than usual. In some years such as 2006/07 or 2009/10 and 2010/11 they did not form at all and thick multi-year ice left the Arctic via a passage that is now closed. This leaves only Fram Strait to the east of Greenland for such export this year. 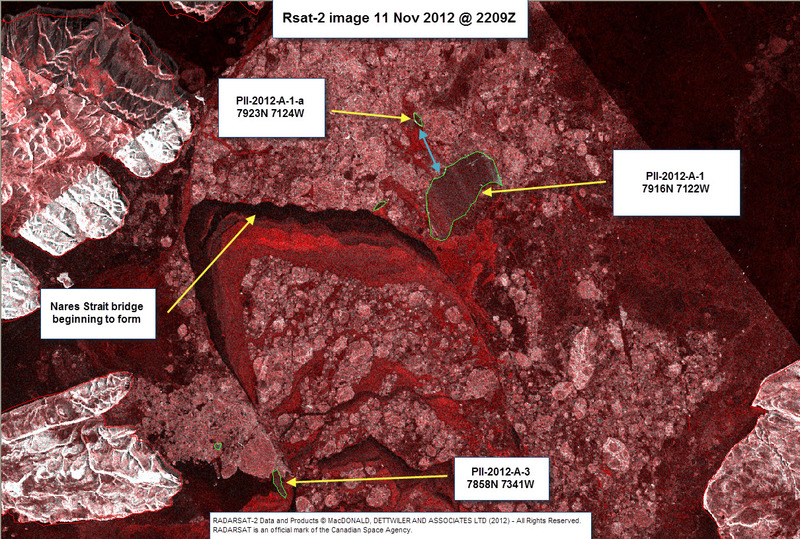 Profile of Petermann Glacier from laser (red) and radar (black) measurements on May-07, 2011. The 2012 break-up is indicated by a spike of the red under-ice topography near km-22. 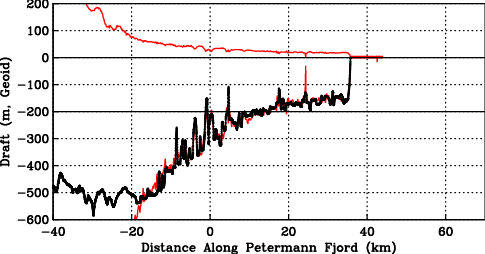 Bottom profiles from laser assume hydrostatic balance of floating ice. The ATM is a scanning laser that measures the distance from the DC-8 to the surface within 0.2 meters (about 6-7 inches). If I know both the true sea level surface (I do, it’s called the geoid) and if the ice is floating undisturbed, then I can convert the surface elevation into a bottom draft. The red curve outlines the “theoretical” bottom of the glacier. This curve is masked by a thicker black curve that is a radar-derived image of the under-side of the glacier. Nothing theoretical about that one. 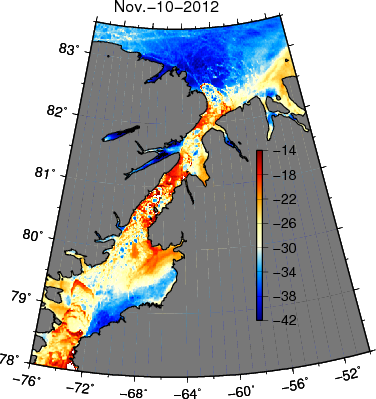 These radar measurements agree closely with the red curves indicating an almost perfectly balanced floating glacier. This “balance” breaks down at two important points: (1) Near -20 km the glacier bottom is shallower than the red draft curve and it is here that the glacier sits on land as it is not floating. (2) Near +22 km we see a large red spike. This is the location of the 2012 break-up. So, the 2012 ice-island that is anchoring the ice arch in southern Nares Strait is the piece of the glacier to the right of the red spike and with these data I can now conclude that PII-2012 was 11 km long, 15 km wide, and about 200 m deep. This Manhattan-sized ice-cube weights about 30 gigatons (10^12 kg), but “… that doesn’t mean much — who goes to the store and buys a gigaton of carrots? For a sense of perspective, a gigaton is about twice the mass of all people on earth …” [James Fallows writing for The Atlantic]. Hence this little ice-cube weights 50 times as much as do all people living on earth today. Incidentally, it is also the amount of CO2 that all humanity adds each year to the atmosphere. Coincidence. 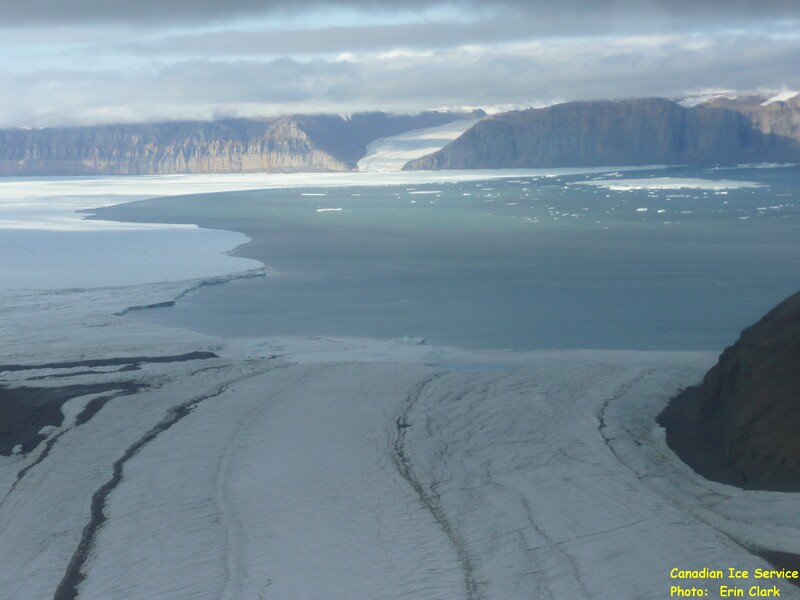 This entry was posted in Ice Arch, Ice Cover, Petermann Glacier and tagged Greenland, ice island, Nares Strait, Petermann. Bookmark the permalink. I fear I neglected to hit “post” with my last comment. The temperatures above don’t seem to match with what Buoy air temperatures are indicating. Buoy 47543 has -25.6 to -34.7 for the 10th at 83-33 N by 062-03 W. The days leading up to this were generally warmer. It was around this time that there was some ice movement in Nares Strait, which would be difficult at the temperatures indicated. Terry: And another wonderful link with data I knew nothing about, thank you. On the discrepancies of buoy-derived air temperatures and satellite-derived surface temperatures, I would not expect the two to be similar except within broad ranges. The radiometer aboard MODIS measures the radiation emitted in the infra-red, the temperature derived represents the temperature of the emitting surface within a fraction of a millimeter. This surface can be the surface fraction of a millimeter of water or ice or snow or a mixture of all of the above that are found within an area that is bigger than a kilometer square. Given these discrepancies, I actually take comfort that the buoy measures -32 degrees C for a daily average at a point for air which is colder, but within the general range that the satellite sees within a fraction of a second averaged in space.